Sample Road Auto Spa provides premier full-service car wash packages in Deerfield Beach. Our years of industry experience and specialized products enable us to safely and harmlessly clean and preserve the Sample Road Auto Spa provides premier full-service car wash packages in Pompano Beach. Our years of industry experience and specialized products enable us to safely and harmlessly clean and preserve the finish of your car. We welcome our patrons with a friendly smile and take care of your car as we do our own. We can make your car look brand new again with our top-rated premium full-service car wash packages in Pompano Beach. You can relax in a clean, comfortable and welcome environment while we transform your car. We want you to be 100 percent satisfied with our services, and our team of experts works hard to return your car to its former showroom beauty. 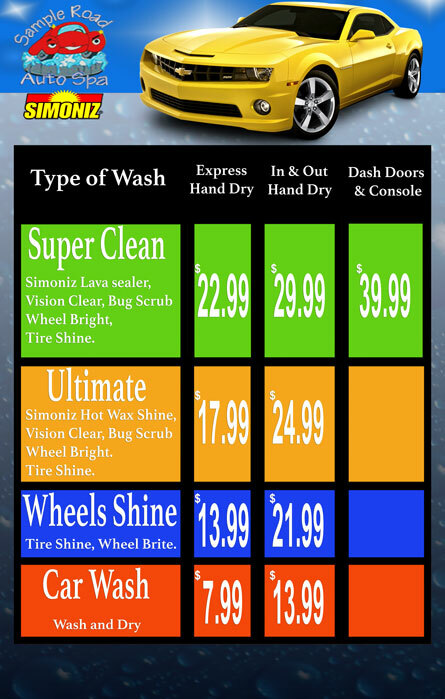 Highlights of our full-service car wash details are listed below. At the starting g area, a team of professionals manually cleans the interior of your vehicle, removes trash, vacuum, wipes down the dashboard and doors. The cleaning system is quite different from traditional home vacuums. Overhead hoses connect to a central vacuum system with a powerful air pump for a deep cleanSeveral pieces of equipment, all with a distinct purpose, clean the exterior of your car. Services include: pre-soak, simonize clear coat wax and simonize Hot Wax Process, Simonize Vision Clear and double high-pressure rinse. While a team dries the car, another cleans and polishes the rims. Sign up for our newsletter to get all our latest information and specials. All information provided is provided for information purposes only and does not constitute a legal contract between Sample Road Auto Spa and any person or entity unless otherwise specified. Information is subject to change without prior notice. Although every reasonable effort is made to present current and accurate information, LinkNow!™ Media makes no guarantees of any kind.